Endodontics or Root Canal Therapy is probably the most dreaded dental term known to the layperson. However, preconceived notions that root canal treatment is filled with pain and discomfort are nothing more than outdated myths. In fact, root canal treatment does not cause pain but actually relieves it. Despite its bad reputation endodontic therapy has a general success rate between 90 and 95 percent. With state-of-the-art modern techniques root canal treatment can be a virtually pain free experience. By removing the decay and infection and sealing the tooth, the goal of saving the tooth versus extracting it is achieved. Saving a tooth prevents a domino effect of teeth tilting and shifting and becoming more sensitive and prone to decay. Saving teeth helps prevent the unfortunate situation of having to wear dentures or the expensive replacement of teeth with implants. New nickel titanium files have helped tremendously in speeding up the procedure and resulting in much less discomfort. The treatment may require one to three sessions, this depends on the number of roots and the complexity of the case that is often unpredictable when the molars are involved. During these visits the dentist removes the damaged or diseased pulp tissue. 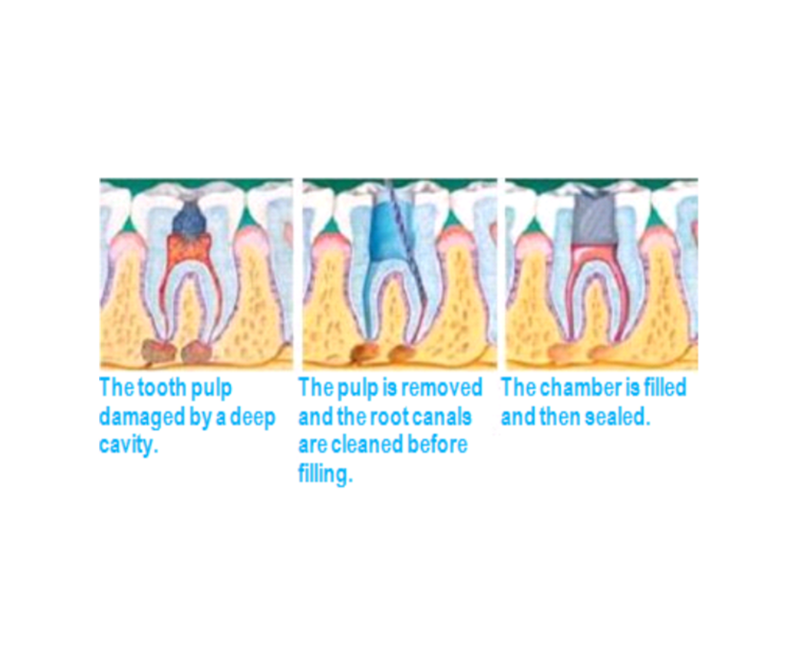 The root canals are cleaned, disinfected, widened and sealed to prevent recontamination of the root canal system. It is highly recommended that the treated tooth have a crown placed over it to protect it from splitting in half. After restoration the tooth continues to function like any other tooth. Most patients are pleasantly surprised and appreciate the advances in modern dentistry.